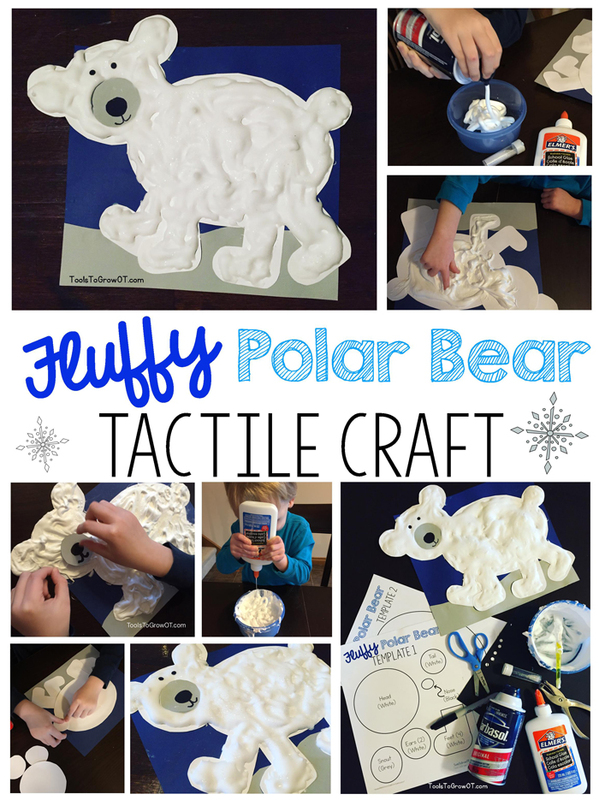 Fluffy Polar Bear - Tactile Craft | Blog | Tools To Grow, Inc.
We have a great tactile winter Polar Bear craft that children of all ages will love to make! This activity addresses a variety of skills including fine motor control, bilateral coordination, visual motor integration, visual perception, and sensory processing. Spatial Relations to properly perceive polar bear parts relative to oneself and in relation to each other. This activity allows a child the opportunity to explore and create with their fingers! - Print out Polar Bear Pattern/Templates (2 pages total) on cardstock or heavy paper. - Cut out each individual part - the child will use these to trace. 1. The child uses the stencils (patterns) to trace each part of the Polar Bear as indicated on colored or white construction paper/cardstock. For example, the child would trace the foot stencil four times on white cardstock/construction paper. 2. Cut out all pieces (adult may need to assist depending on skill level of child). 3. Take a full page of construction paper (we used dark blue) and glue a strip of grey construction paper to the bottom for snow. 4. Assemble and glue the feet, body, head, ears, and tail together on a full page of construction paper. 5. 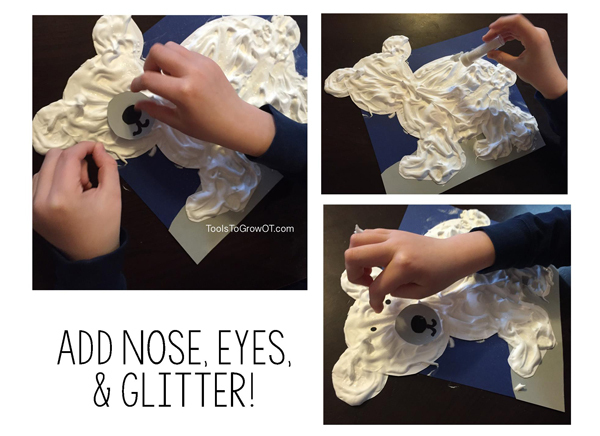 Mix shaving cream and glue (see printable recipe) to create “fluffy paint” for the Polar Bear’s body. 6. Once mixed, transfer the fluffy paint onto the Polar Bear with fingers or tool (paintbrush, q-tip, etc.). 7. Glue the black nose onto the gray snout. 8. Draw a mouth on the gray snout with a black marker. 9. Press completed snout, nose, and mouth into the fluffy paint on the Polar Bear’s head. 10. Using a hole punch, punch out 2 small black dots for eyes and press into fluffy paint on face. 11. Shake white glitter into the fluffy paint for a fun glitter effect! 12. Allow craft to dry before hanging up. Some children may initially resist mixing the ingredients with their fingers. Allow them to use a spoon until he or she develops a tolerance. Some children may need to apply the mixture with a paint brush. When dry the paint will have an elevated or puffy appearance. Be sure to check out our Sensory Challenge Educational Series for Home. These informational resources and handouts are written in an understandable and comprehensive manner targeting many consequences of difficulties with sensory processing. Use these handouts to help children manage the following Sensory Challenge Areas: Tactile, Auditory, Vestibular, Daily Living Skills, Community Skills, and Attention & Challenging Behavior. Sensory Challenge Educational Series for School is an Educational Series that includes 31 Pages of Tips, Strategies, and Detailed Information to Help Students Cope at School. Sensory Challenge Areas Include: Tactile, Auditory, Vestibular, and Attention & Challenging Behavior. Read the blog post on this series here! Looking for more winter fun?? We have LOTS of new winter themed resources! 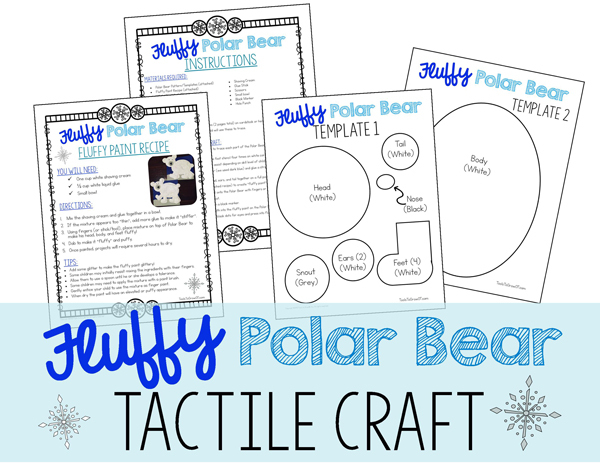 This winter themed polar bear quilt activity is designed to promote development of following directions, eye-hand coordination, fine motor, and visual motor integration skills. Includes detailed directions to assemble, visual sequencing steps, quilt template, weaving strips, and sleeping polar bear visual (this is where the child will place the quilt!). This 20 page print and go packet includes a variety of performance and skill areas! FREE Trial Roll & Color/Roll & Colour can be found here! 3. "Hole Punch" of Mitten Fun! FREE printable! 6. If I were a Penguin - Craft & Tactile Activity FREE printable! Read blog post on this activity here! Self-Help/Life Skills ADL Winter Dressing Game! This fun and exciting ADL game is great to play individually or in a group setting. It helps children improve their fine motor control and motor planning skills required for dressing. We hope these winter themed resources will be SNOW much fun!!! !